After a very long break from this blog, I'm going to be updating regularly once more. The hiatus is in part due to big projects I'll be sharing here shortly, and in part due to ongoing (but treatable and improving) health problems. It turns out I've had sleep apnea for years and it was just getting worse all the time. I finally got a good diagnosis and some surgery and now I have so much more energy! It turned out I was getting about 50% as much deep sleep for the amount of time I was "asleep" in bed as a normal person - so even when I slept 10 hours, it was like I slept 5. (It certainly felt like that.) More than 20 times an hour I would wake up gasping (for fewer than a few seconds at a time) because I had stopped breathing. I had recurring dreams of drowning, which have pretty much stopped since my surgery. 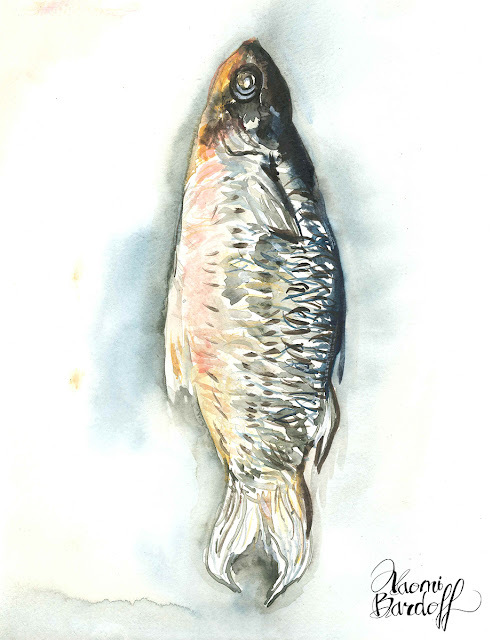 So this fish is a self-portrait of sorts. Original is 9"x12", watercolor on paper.